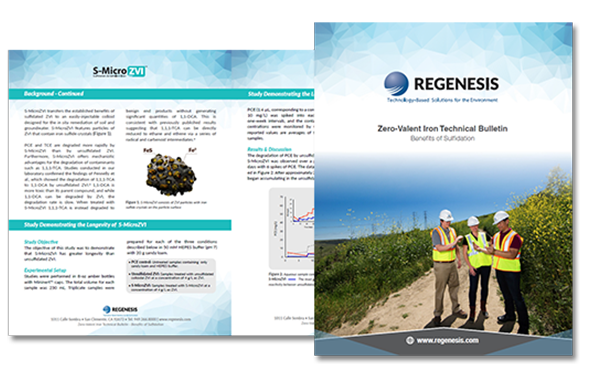 REGENESIS offers S-MicroZVI™, an advanced zero-valent iron (ZVI) product proven to accomplish In Situ Chemical Reduction (ISCR) of contaminants within the subsurface environment. S-MicroZVI is delivered as a colloidal suspension 40% ZVI by weight in glycerol with a particle size of less than 5 microns. 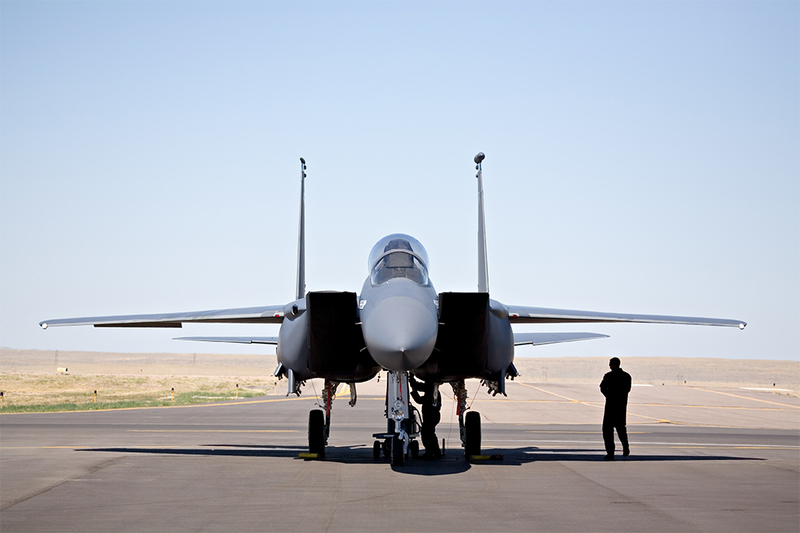 S-MicroZVI is manufactured using a state-of-the-art sulfidation process resulting in a particle coating which increases activation toward specific contaminants and extends performance longevity. S-MicroZVI destroys contaminants abiotically and applied to stimulate ISCR-enhanced bioremediation. EASY TO APPLY- Micron-scale, zero-valent iron suspended in a colloidal solution allows for easy handling and application on-site. DISPERSES INTO GROUNDWATER- Micron-size particles flow through soil pores dispersing outward without the need for fracturing or mechanical mixing in the subsurface. MAXIMUM ISCR ACTIVITY- outperforming commodity iron 30-40 times. STIMULATES ENHANCED BIOREMEDIATION- Creates an anoxic and highly reducing environment, providing ideal conditions for sequential enhanced anaerobic biodegradation to destroy chlorinated contaminants. 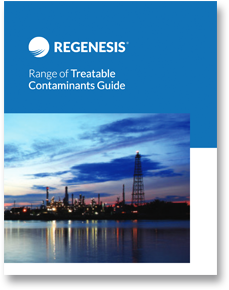 TREATS A WIDE RANGE OF CONTAMINANTS (Range of Treatable Contaminants Guide). 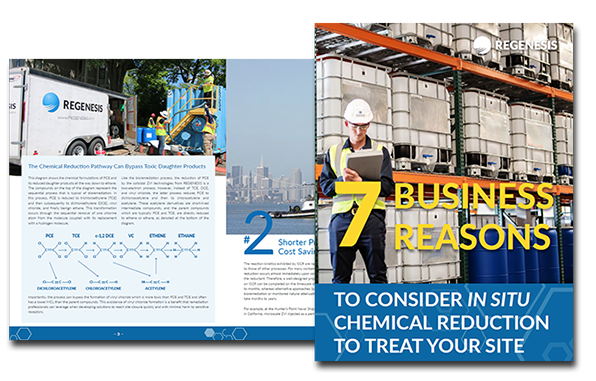 This ebook outlines the benefits of in situ chemical reduction (ISCR), an approach that can be highly effective when designing a remedial strategy. 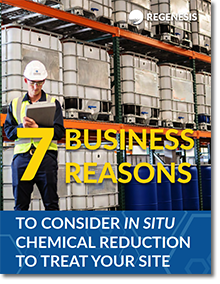 Though in situ chemical reduction has been in use for some time, recent technological advances have improved it as a remedial approach. A proliferation of remedial technologies based on chemical reductants such as ZVI, which is highly effective against chlorinated solvents, some metals, and other contaminants, has been recently developed. 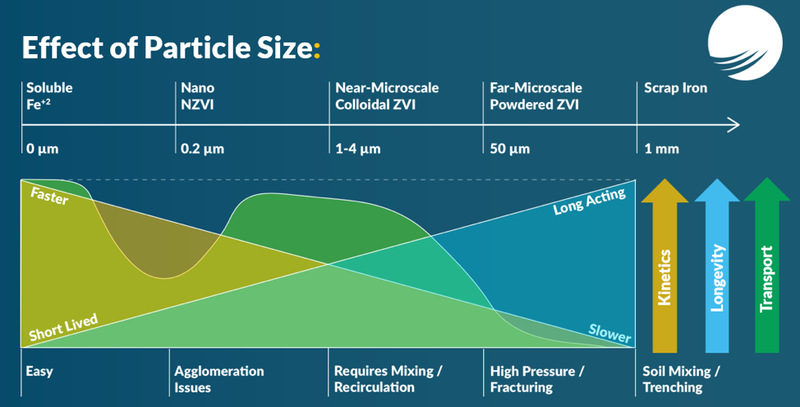 REGENESIS has developed the in situ remediation technology S-MicroZVI™, a sulfidated, colloidal suspension of ZVI micro-scale particles less than 5 μm in size that can easily be injected and is chemically reactive in the subsurface. 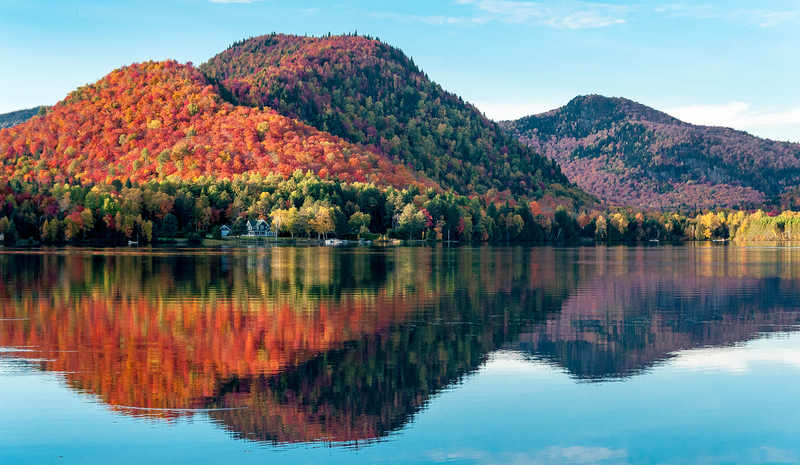 In Situ Chemical Reduction (ISCR) enhanced bioremediation is a remediation approach that combines zero valent iron (ZVI), an organic hydrogen donor, and contaminant-degrading microbes to degrade contaminants in soil and groundwater. This approach is most commonly used for chlorinated contaminants including chlorinated ethenes. 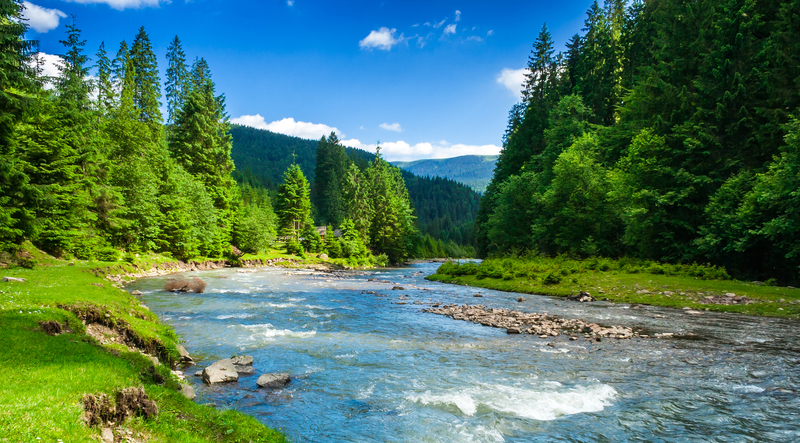 ISCR-enhanced bioremediation is particularly effective because it stimulates anaerobic biological degradation by rapidly creating a reducing environment favorable to reductive dechlorination. Furthermore, ISCR-enhanced bioremediation may limit the formation of toxic daughter products such as cis-1,2-dichloroethene (cis-DCE) and vinyl chloride (VC) by degrading parent compounds abiotically, or via direct chemical reduction. 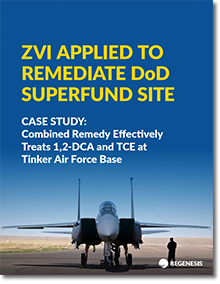 This case study reviews the remediation of dichloroethane (1,2-DCA) and Trichloroethylene (TCE) using colloidal zero valent iron (ZVI) at Tinker Air Force Base, a major United States Air Force base located in Oklahoma City, Oklahoma. The remediation included an application of emulsified vegetable oil (EVO), an aqueous suspension of colloidal zero valent iron (MicroZVI Precursor), with small amounts of fertilizer and B12. Typically, zero valent iron cannot be applied through well systems. However, due to the small particle size of the zero valent iron, this application was successfully applied through the existing wells. At 3 years post-injection, the contaminant levels remain near zero with the presence of ethene indicating continuous biodegradation. S-MicroZVI is an In Situ Chemical Reduction (ISCR) reagent that promotes the destruction of many organic pollutants and is most commonly used with chlorinated hydrocarbons. It is engineered to provide an optimal source of micro-scale zero valent iron (ZVI) that is both easy to use and delivers enhanced reactivity with the target contaminants via multiple pathways. 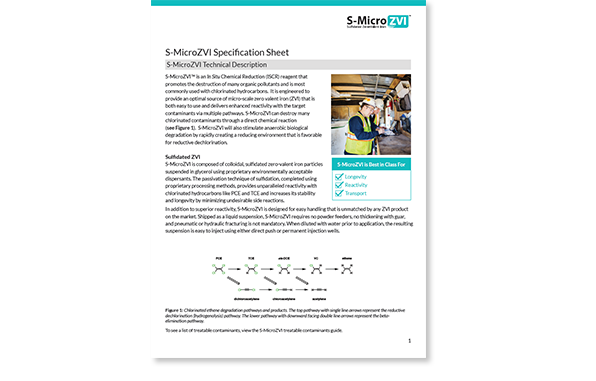 S-MicroZVI can destroy many chlorinated contaminants through a direct chemical reaction. S-MicroZVI will also stimulate anaerobic biological degradation by rapidly creating a reducing environment that is favorable for reductive dechlorination. S-MicroZVI and other ZVI products are used in soil and groundwater remediation as an in situ chemical reduction (ISCR) reagents. Chemical reduction is the process of adding or donating electrons to contaminants, while chemical oxidation is the process of removing or accepting electrons from contaminants. The ZVI acts as a reducing agent to provide electrons directly to the contaminant for degradation or to support processes that require electrons to degrade contaminants. Zero-valent iron can provide an abiotic degradation pathway involving the direct reaction of ZVI with groundwater contaminants. The abiotic, “beta-elimination pathway” for chlorinated ethenes is shown in the bottom of Figure 1. The abiotic pathway involves short-lived dichloroacetylene and chloroacetylene intermediates, bypasses the formation cDCE and VC, and ultimately results in ethene and ethane. Figure 1: ISCR or beta-elimination (double-line arrows). Beta-elimination avoids the formation of cDCE and VC. Biological degradation involves the destruction of contaminants by anaerobic bacteria that are supported by the molecular hydrogen that is produced by the fermentation of organic hydrogen donors or by the reaction of ZVI with water. The biological degradation pathway for perchloroethene (PCE) and trichloroethene (TCE) is provided in Figure 2. This pathway, called reductive dechlorination (or hydrogenolysis), involves the sequential replacement of a chlorine atom with a hydrogen atom and is always accompanied by the formation cis-1,2-dichloroethene (cDCE) and vinyl chloride (VC). Many common anaerobic bacteria can transform PCE to TCE and then to cDCE, but only Dehalococcoides ethenogenes (DHC) can transform cDCE and VC to ethene. Figure 2: Reductive dechlorination sequentially replaces chlorine atoms with hydrogen atoms. The intermediates cDCE and VC are more toxic than parent compounds PCE and TCE. Supplementing dechlorinating bacteria with zero-valent iron and organic hydrogen donors can enable more rapid and complete biodegradation. Zero-valent iron quickly deoxygenates groundwater and provides an electrochemically reducing environment that is highly fertile for the microbes involved in anaerobic bioremediation. In many situations this favorable environment can be sustained for several years. ISCR-enhanced bioremediation is a term describing the remediation approach that combines zero-valent iron (ZVI), an organic hydrogen donor, and contaminant-degrading microbes (native or bioaugmented) in order to degrade contaminants in soil and groundwater. This approach is most commonly used for chlorinated contaminants, e.g. chlorinated ethenes. ISCR-enhanced bioremediation is particularly effective because it stimulates anaerobic biological degradation by rapidly creating a reducing environment favorable to reductive dichlorination. Furthermore, ISCR-enhanced bioremediation may limit the formation of undesirable daughter products such as cDCE and VC by degrading parent compounds via direct chemical reduction. ISCR-enhanced bioremediation can be used to treat contaminants such as chlorinated solvents, haloalkanes, and chlorinated pesticides. Contaminants that are resistant to abiotic degradation (e.g. 1,2-dichloroethane or dichloromethane) and compounds that can inhibit bioremediation (e.g. 1,1,1-trichloroethane or chloroform) may be effectively treated by ISCR-enhanced bioremediation. 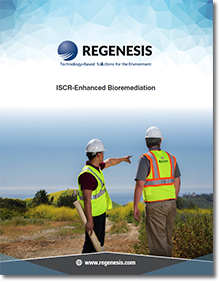 ISCR-enhanced bioremediation can be used for source zones, plumes, and barrier applications. S-MicroZVI is a suspension of sulfidated, colloidal zero-valent iron (ZVI) that promotes the destruction of many organic pollutants, including chlorinated solvents, pesticides, haloalkanes and energetics. It is engineered to promote multiple pathways for contaminant degradation which leads to faster cleanup while minimizing daughter product formation. In addition, S-MicroZVI is easy to handle and simple to inject leading to significantly better reagent distribution. In many cases this improved formulation of ZVI can also destroy contaminants through a direct chemical reaction as shown in Figure 3. Figure 3. Example of chlorinated ethene degradation pathways and products. The top line with single-line arrows represents the reductive dechlorination (hydrogenolysis) pathway. The downward facing double-arrows represent the abiotic beta-elimination pathway. S-MicroZVI is composed of colloidal, sulfidated zero-valent iron (ZVI) particles suspended in an aqueous medium with environmentally-acceptable, proprietary dispersants. The passivation technique of sulfidation, completed through proprietary processing methods, provides unparalleled reactivity with chlorinated hydrocarbons like PCE and TCE, and increases its stability and longevity in situ by minimizing undesirable side-reactions. In addition to superior reactivity, S-MicroZVI is designed for easy handling that is unmatched by any ZVI material on the market. Shipped as an suspension in glycerol, S-MicroZVI requires no powder feeders, no thickening with guar, and pneumatic or hydraulic fracturing is not mandatory. When diluted with water in the field, the resulting suspension is easy to mix and inject using direct push or injections wells. S-MicroZVI is diluted with water on site and easily applied into the subsurface through low-pressure injections. S-MicroZVI can also be mixed with products like 3-D Microemulsion or PlumeStop prior to injection.